In How Chiefs Became Kings, Patrick Vinton Kirch addresses a central problem in anthropological archaeology: the emergence of “archaic states” whose distinctive feature was divine kingship. 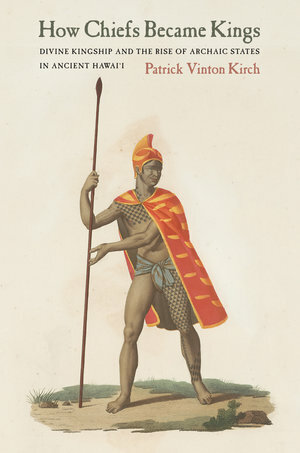 Kirch takes as his focus the Hawaiian archipelago, commonly regarded as the archetype of a complex chiefdom. Integrating anthropology, linguistics, archaeology, traditional history, and theory, and drawing on significant contributions from his own four decades of research, Kirch argues that Hawaiian polities had become states before the time of Captain Cook’s voyage (1778-1779). The status of most archaic states is inferred from the archaeological record. But Kirch shows that because Hawai`i’s kingdoms were established relatively recently, they could be observed and recorded by Cook and other European voyagers. Substantive and provocative, this book makes a major contribution to the literature of precontact Hawai`i and illuminates Hawai`i’s importance in the global theory and literature about divine kingship, archaic states, and sociopolitical evolution. Patrick Vinton Kirch is Class of 1954 Professor of Anthropology and Integrative Biology at the University of California, Berkeley. He is the author of many books, including Feathered Gods and Fishhooks and On the Road of the Winds (UC Press).